Suddenly, the Art Museum's Anne d'Harnoncourt Sculpture Garden has a work of real stature. 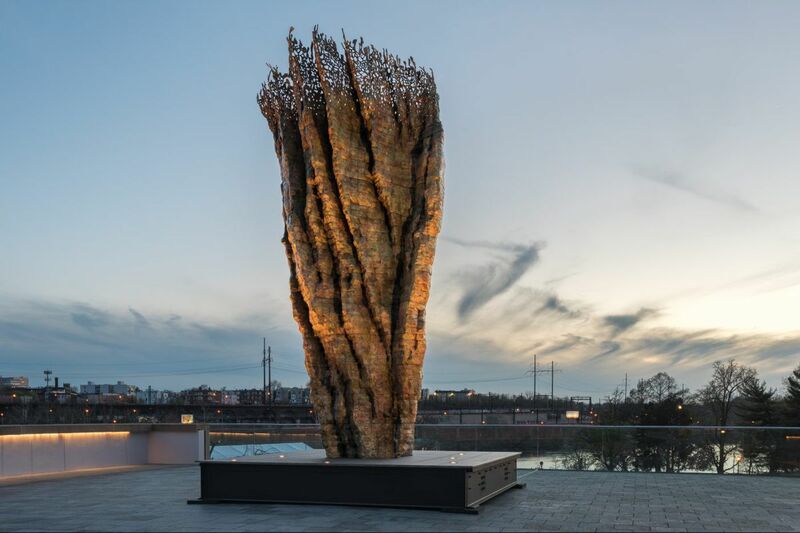 The arrival of Ursula von Rydingsvard's Bronze Bowl with Lace, (along with the artist's cast resin Elegantka II) transforms a place that has long felt like an afterthought to a destination that must be visited. While the garden boasts other works by distinguished artists, these two have the size and scale to organize and command the space. Indeed, the 20-foot bronze, which stands in a courtyard of its own, seems to enter into a dialogue with the entire landscape of the city. The translucent Elegantka is a nearly figurative piece, a monumental female form that a garden named for a formidable woman ought to have. But despite their size, these works are also tremendously subtle. The passing of a cloud changes the many colors of the bronze patina, and a burst of sunlight brings out the lines and shadows of its faceted surface. As you walk around it, it reveals new clefts and curves. And when you scrutinize it, each bit of surface seems to offer something new. Many people worked to realize these pieces, but they feel handmade, the outgrowth of a deeply personal vision. They will be on display until at least April, though Bronze Bowl with Lace, one of an edition of three, is so perfect on its site it's hard to imagine there won't be efforts made to keep it. These two sculptures have been installed at the museum in conjunction with an extraordinary exhibition, "Ursula von Rydingsvard: The Contour of Feeling" at the Fabric Workshop and Museum, through Aug. 28. Ursula von Rydingsvard’s “Scratch II, COŚ” (left) and “PODERWAĆ” in the exhibition “The Contour of Feeling” at the Fabric Workshop and Museum. It is the largest U.S. exhibition to date of one of the most compelling sculptors of our time. Though it includes a couple of her most celebrated early works — including Zakopane (1987), the wall-like work that first got her noticed — the show concentrates on works of the last two decades. The title of the show, which was curated by Mark Rosenthal, has multiple meanings. Von Rydingsvard's works tell us little about what they mean, but they pack an enormous emotional wallop. They are also about a different kind of feeling, the meeting of skin, nerves, and substance. The surfaces of her pieces are cut, sawn, gouged, distressed, smeared. Their texture is a large part of their content. Moreover, von Rydingsvard claims she never makes a drawing or a model for her sculptures, many of which are enormous. Rather, she begins with a basic idea and a rough chalk outline on the floor, and feels her way, touching and reacting emotionally, changing and adjusting, until they reach their ultimate form. Ursula von Rydingsvard working on PODERWAĆ in her studio in Brooklyn in , 2017. Most of her works begin as 4-by-4 cedar boards, on which she marks cuts for her assistants to make. This dimension provides a fundamental regularity, scale, and rhythm that she feels free to bend, distort, or interrupt. These boards are screwed and glued together, and are often cut and gouged. Even the two pieces at the Art Museum began life this way, though they were later cast. The works that result usually invite multiple readings. Because of their layering and crevices, they often have the look of dramatic eroded landscapes, though the sculptor says she doesn't think of them that way. Occasionally, they are directly representational; there is a pair of monumental wall-mounted shovels, for example. Ursula von Rydingsvard’s “Droga” (2009) at the Fabric Workshop and Museum. More often, their appearances shift as you walk around the pieces. Droga (2009) appears from across the gallery to evoke an Indian figure of a cow. Up closer, this silhouette disappears and you notice that it is a hollow form, open at both ends. At the back, any sense of a body disappears. Perhaps viscera are falling out of a corpse, or perhaps it is an abandoned quarry. For Staś (2011-17), named for her favorite brother, appears initially to be a sphinx, then a series of small domed buildings, and then there is a tail that turns it back into some sort of creature. As with all her work, "what it is" is far less important than the act of experiencing it. Unlike many artists who work in wood, von Rydingsvard does not celebrate the beauty of the material. On many of her pieces, including these two, she blackens some of the surfaces with graphite, either to articulate the shapes or to undercut easy interpretation. She says she did this to For Staś because it was becoming "too sphinxy." Von Rydingsvard gives many of her works titles in Polish in an effort to avoid being too easily understood. Apparently, they don't convey much information even if you know Polish. It is also tempting to connect the works with her life story. She was born in 1942 to a Polish mother and Ukrainian father in a forced labor camp in Nazi Germany. After the war, her family lived in one refugee camp after another. In 1950, they were admitted to the United States, and she grew up in Connecticut. Her work contains few direct allusions to these experiences. But they share a sense of the tragic. Their distressed surfaces evoke awareness of the hurts we all have. Their size and daring tell us that, nevertheless, great things are possible. They are about working hard and being serious. That's why I was surprised to hear about the work she created especially for this show with staff members at FWM. Called PODERWAĆ, it is an immense leather jacket made from 193 used leather coats. It is about 11 feet by 9 feet by 4 feet, and she figures seven people could fit inside, with the sleeves dragging on the ground. That idea sounded uncharacteristically poppish to me, but I needn't have worried. The jacket is not as absorbing and provocative as the cedar sculptures that are the result of decades of work and thought. But it may be even more emotionally direct. Leather is, after all, skin. The skins in this coat have been through a lot, and it shows. It isn't, as I feared, a big joke. It is an offbeat monument to wear and tear, to injury and experience — and maybe even a new start. Now, She: Two Sculptures by Ursula von Rydingsvard. Through April 28, 2019, at the Anne d’Harnoncourt Sculpture Garden outside the Philadelphia Museum of Art, 2600 Benjamin Franklin Pkwy., 215-763-8100, philamuseum.org. Ursula von Rydingsvard: The Contour of Feeling. Through Aug. 26 at the Fabric Workshop and Museum, 1214 Arch St., 215-561-8888, fabricworkshopandmuseum.org.